The English Setter is one of several setter breeds. These dogs were developed to 'set', once they have located game birds, they until given further instruction by their hunter. Before the invention of gunpowder this allowed for the prey to be captured by nets, where in more modern times they would be flushed toward the waiting guns. Today, with less demand for hunting and the more refined all-purpose gundogs, most setters are kept as companions or show dogs. The English Setter is a breed of gundog that was developed in England. Documentation of setter-type dogs in England traces back to the 16th century, although, like the spaniel it is unknown for certain how they arrived in Britain. It is believed they developed from spaniels and the two most widely accepted theories are setting dogs arrived either from Spain or France. Suggested dogs used in their development include the ancestors of the Spanish Pointer, water spaniels, English Springer Spaniel, and Brittany. By the 19th century there were a large number of English Setters being developed, each area having its own localized strain. Most had minor variations and included the Anglesea, Featherstone, Llewellin, Newcastle, Old Hemlock, and Ryman Setters. 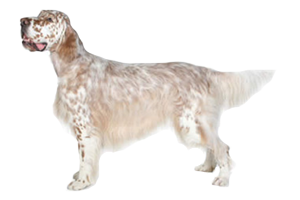 Edward Laverack is the breeder credited with creating the strain that we recognize today as the English Setter. He began breeding in 1825 and spent the next half century improving his dogs. Is the English Setter Right for You?